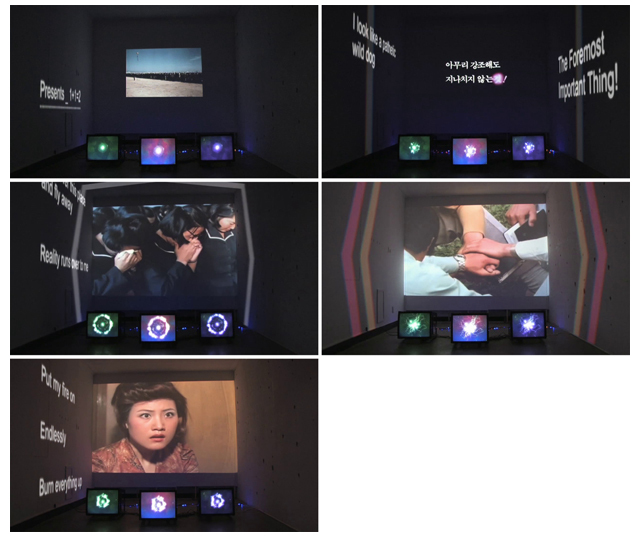 The social landscape that surrounds Yoon Suk Jung works for him as a déjà vu of propaganda films of 70s and 80s which he researched for The Home of Stars. This déjà vu encompasses the death of Park Jung-hee in 1979 and death of Roh Mu-hyun/Kim Dae-jung three decades later, the fabrication of North Korean spies in the past and revival of anti-Communist ideology through appropriating the issue of sunk military vessel, and repeated suppression of trade unions. ,Witnessing these aftershocks from the past within South Korean society, I realize that the wailing of ,old ghosts‘ was not a requiem for sorrowful past but a funeral song for the coming dead in the future.‘ The screen version of The Home of Stars is based on video documentation of an installation work with the same title. It was installed at the former Kimusa (Defense Security Command) site, which was a historical background of the work. The Home of Stars aimed to reflect on historical meaning of the site, while at the same time surmounting visual limitation generated by installation format. Künstler und Filmemacher. Lebt und arbeitet in Seoul. Ausstellungen (Auswahl): ,From blank page‘, Art space POOL, Seoul, 2011; ,Closer to Contemporary Art‘, Gyeooggi Museum of Modern Art, Suwon-si, Gyeonggi-do, 2011; ,Platform 2010‘, Art Sunjae, Seoul, 2010; ,88‘, Kumho Museum of Art (solo), 2009.